If you have been into database administration & development for a while now, what is the first thing that comes to your mind when someone asks to modify database options like setting the database read-only, or taking it offline? Answer: The sp_dboption system stored procedure. However, starting SQL Server 2012, attempting to change the database options this way would produce the following results. Could not find stored procedure ‘sp_dboption’. 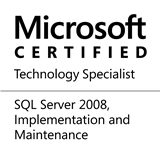 The sp_dboption system stored procedure was marked as “discontinued” ever since SQL Server 2005. Yet, I have seen a lot of production code this year itself that uses the sp_dboption statement. All of this code will break unless it is replaced with ALTER DATABASE…SET statement. This entry was posted in #SQLServer, Blog, Imported from BeyondRelational and tagged #SQLServer on May 21, 2012 by nakulvachhrajani.